Before MSG came into widespread use there were no commercially available chicken or beef broths available so it turns out Grandmother knew best when she used what she had and made delicious and nutritious homemade broths. The homemade broth or stock contains minerals including calcium but also magnesium, but also phosphorus, silicon, sulphur and other trace minerals. 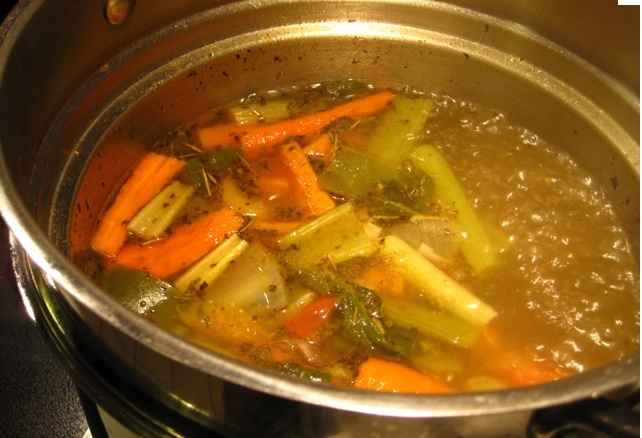 Homemade broth helps build the immune system. We all know that chicken soup is also known as “Jewish Penicillin”. Good stock contains gelatin that has been proved useful in the treatment of diseases and very nourishing to the gut. Examples of diseases that benefit from homemade broth include peptic ulcers, infectious diseases, jaundice and cancer. French studies showed that babies had fewer digestive problems when gelatin was added to their milk. Ask any soup maker – homemade broth makes superior soups, is excellent to drink when sick, and perfect for Real Gravy. If you make homemade turkey stock from the leftover bones the flavor skyrockets to a perfect “10”! Even if you can’t try this recipe out this year, be sure to save the recipe for future use. I usually double the amounts to have some leftover soup for the freezer. If you let the soup sit a day, the flavor improves with age. We’ve eaten this in bread bowls that I’ve made. Fabulous! Combine carrots, broth, onions, celery, broccoli, and salt. Bring to a boil over medium heat. Simmer 10 minutes. Bring to rolling boil again, and gradually stir in the oat flour, stirring constantly. Let simmer another 10 minutes until lumps disappear. Reduce heat. Add milk, turkey. Remove from heat. Stir in cheese. Serves 4-6.